Myrkvedr is a new Viking folk metal band from Gothenburg, Sweden. They were formed in 2010 with the intention to mix extreme metal with folk tunes and traditional instruments, influenced by Viking mythology. In 2011 the band released its 5-track demo “Tryms Kväde” and made several gigs around Sweden. Finally on November 2013 they self-released their debut full-length album “Sons of Muspell“. The first think I have to comment about this album is its sound quality. The band wanted a more underground and personal sound, thus recording, mixing and mastering were done by themselves. Whether it was intentional or not, the final result of their production doesn’t “flatter” their music. Luckily enough, the composition level is in a much higher standard, at least in some songs! Myrkvedr play raw underground epic folk metal with black and death metal elements. The use of beautiful flutes by Runar works very good for the band, making songs like “Brynhilds Call“, standing out of the rest. His flutes have a relatively natural sound and in combination with some melodic traditional tunes in the guitars, they make their folksier compositions sounding much better in my opinion. There are several references to some big names of the genre, but the band tries to make something personal and this is very important. 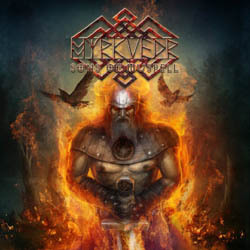 They have a very epic soundtrack atmosphere throughout the whole album and it’s obvious they want to reflect the “brutality” of the Viking era in their music, thus this raw unedited sound… Their compositions are quite diverse, moving from epic folk ballads to extreme metal outbursts and from melodic folk metal to brutal rhythmic parts. Their vocals also vary from brutal to epic clean vocals, choirs and few female vocals, all in an average level. “Sons of Muspell” lasts for almost an hour and there are totally 15 songs in the album, including a bonus cover on Nordman’s “Vandraren“. Their lyrics are half in Swedish and half in English, except for one track in Icelandic, all inspired by the Viking culture and mythology.